X-Men: Apocalypse is the first X-Men film in the newly established timeline which had been reset by the events in X-Men: Days of Future Past. With that in mind we will be seeing younger versions of characters who may have already appeared in the franchise. Tye Sheridan plays Cyclops, replacing Jason Marsden who appeared as the character in the first three films and Days of Future Past. Sophie Turner will be the new Jean Grey, formerly played by Famke Janssen. And Alexandra Shipp is the younger version of Storm, who was originally played by Halle Berry. We also know that this is the final film in the First Class trilogy, with Singer looking forward to more X-Men films after he is finished with 20,000 Leagues Under The Sea. But he’ll likely have to do it without the talents of Jennifer Lawrence and Hugh Jackman, seeing as they won’t be returning after this film – well after The Wolverine 3 for Jackman. The film also stars Nicholas Hoult, Rose Byrne, Olivia Munn, Lucas Till, Evan Peters, Kodi Smit-McPhee, Alexandra Shipp, Josh Helman, Lana Condor, and Ben Hardy. 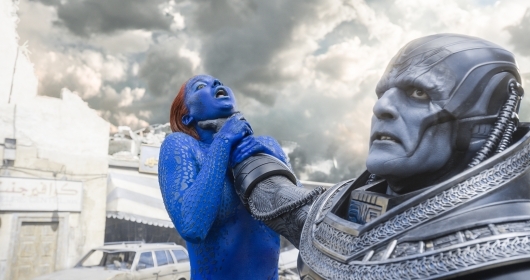 Written by Simon Kinberg based on a story by Kinberg, Singer, Michael Dougherty, and Dan Harris, X-Men: Apocalypse hits theaters on May 27, 2016.